DocuBank Membership | The Levin Law Firm - Philip Levin, Esq. The Levin Law Firm purchases all of our clients a three (3) year membership in a service called DocuBank, which provides emergency access to your Health Care Medical Directives, 24/7/365, both online and via phone or fax. More specifically, we include DocuBank as part of our estate planning services to ensure that your Health Care Power of Attorney, allergies and other important medical information is made available in a timely manner at a hospital where you may be admitted for treatment due to an illness, injury or medical event, when you need these records and where you need them. 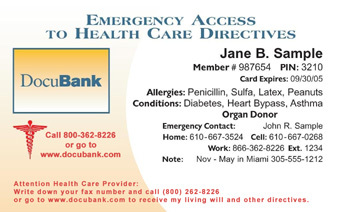 We encourage all of our clients to carry your DocuBank Emergency Card in your wallet — next to your drivers license or health insurance card — at all times. You should also periodically update your emergency contact and medical information stored with DocuBank. To do so, simply click here or on the DocuBank logo. For more information on this valuable service, visit www.DocuBank.com.